WHERE DOES THE NAME GELLER ORIGINATE? One theory is that the name derives from the Yiddish word for yellow (blond) hair ‘geyl’ and hence one of our ancestors who had yellow (blond) hair assumed the name Geyler or Geller. According to Alexander Beider’s A Dictionary of Jewish Surnames Prom the Russian Empire, the definitive 760 page book on the subject of Ashkenazic names, the name was prevalent in many forms throughout eastern Europe. Some of the variants include Geler, Gelir, Kheler, Gellerov, Eler, Elert, Geyler, Giller etc. Beider maintains that the name originates from the town of Schwabish-Hall in Wuttemberg Germany. He continues that the name Heller (German spelling) existed in Schwaben (Swabia) already in the 16th century. Lippman ha-Levi Heller (1579-1654) was rabbi in Prague, Nemirov (Podolia), Vladimir (Vclhynia) and Crocow. He also states that the bearers of this surname were numerous in Vienna in the 17th century and were of Levite origin. God’s most trusted and powerful Archangel is called Uriel … which means God is my Light; God is Light; or Radiation of God; or God is the radiating principle of Light; or Fire of God. Uriel is the spirit of ministration and peace. Uriel helps turn our worst disappointments into our greatest blessings. He is the Archangel of salvation. Uriel teaches the path of the heart, the fire of pure Love. Without this pure Love and devotion to Spirit, all spiritual study remains an intellectual pursuit. Uriel’s symbol of an open hand holding a flame depicts a great gift to humanity. It is the flame of Love to ignite the heart in service to God. Uriel holds out the flame of Love towards all souls. The soul by filling with the flame of Love becomes devoted to serving Yahweh’s plan. Uriel’s flame of Love, the fire of God, the Light of God, purifies emotional and mental understanding transmuting the lower vibrations into frequencies that can assimilate Spiritual Understanding. The planet that Uriel is associated with is Venus, the planet symbolizing love. Uri-el is the Archangel of salvation. Legend says it is Uri-el who stands at the gate of the Lost Eden, with a fiery sword. He was the dark angel (Genesis 32) or man in black who wrestled with Jacob at Peni-el (“face of God”). Jacob asked him, “Do tell me your name, please.” He answered, “Why should you want to know my name?” Uri-el then gave Jacob his new name, Isra-el. Uri-el is noted in the 2nd century BC Book of Enoch (chapter xxi), as the Archangel who helps us with natural disasters and is called for to avert such events, or to heal and recover in their aftermath. He is the great instructor who teaches us that art and study are for experiencing the joy of liberation that comes as wisdom is gained. Among his symbols are the scroll and the book. Archangel Uri-el is identified with the resemblance of a man. Appearing fully human, Uri-el is the “supernal man,” the most anthropomorphic Hayyot serving God’s throne (Ein-Sof). In rabbinical angelology, Uri-el is one of the Archangels sent by God to answer the questions of Esdras (II Esdras iv). He is mentioned in I Enoch and IV Ezra, where he “watches over thunder and terror.” In the Midrash 1, Uri-el is said to be one of the four guardians of God’s throne. Stemming from medieval Jewish mystical traditions, Uri-el has also become the Angel of Sunday ( Jewish Encyclopedia), Angel of Poetry, and one of the Holy Sephiroth. In Milton’s Paradise Lost Book III, Uri-el is in charge of the Orb of the Sun. The name Uri-el means God is my Light; or God is Light; or Radiation of God; or God is the radiating principle of Light; or Fire of God. Uri-el is the Archangel of September. According to the Midrash, he waited 11 months before establishing the formations of the Jewish people in the shape of the celestial circle. He also holds the key to the Bottomless Pit during the End Times. 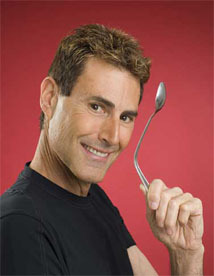 Uri Geller was born in Israel on December 20, 1946. His parents were of Hungarian and Austrian descent, and he is distantly related on his mother’s side to Sigmund Freud. 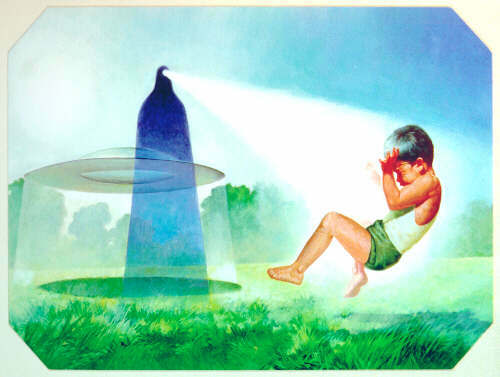 At the age of four he had a mysterious encounter with a sphere of light while in a garden near his house. A retired Israeli air force officer, who was an eyewitness to this encounter, recently validated this mystifying event. Uri first became aware of his unusual powers when he was five. One day, during a meal, his spoon curled up in his hand and broke, although he had applied no physical pressure to it. His parents were somewhat shocked and Uri did not mention the incident to anyone else at that time. He developed these powers in school by demonstrating them to pupils. His mother thought he inherited them from Sigmund Freud. When he was eleven, he went to live in Cyprus, where he remained until he was seventeen. He then returned to Israel, served as a paratrooper in the Israeli army and fought in the Six-Day War of 1967 during which he was wounded in action. Dowsing – Finding the location of precious metals, minerals and oil. Bending, breaking and softening metal and other solids with the power of the mind, e.g. spoons, keys etc, more rarely plastic and glass. Fixing broken watches and appliances, and using collective power, influencing the Big Ben to stop. Erasing computer tapes and disks. Sprouting, causing tiny seeds (mainly red radish) to grow a few centimeters in a matter of seconds. In 1972, Uri left Israel for Europe, where he immediately attracted widespread attention. In Germany, witnessed by reporters and photographers, he stopped a cable car in mid-air using only the power of his mind. He then did the same to an escalator in a major department store. That same year he went to the United States at the invitation of astronaut Captain Edgar Mitchell of the Apollo 14 mission, the sixth man to set foot on the moon, and scientist, inventor and author Andrija Puharich MD. Among the notable scientists he met were Professor Gerald Feinberg of Columbia University physics department, Ronald Hawke from the Lawrence Livermore National Laboratory, Ron Robertson of the Atomic Energy Commission and NASA’s Dr Wernher von Braun, ” Father of the Space Age”, who testified that his own wedding ring bent in his hand without being touched at any time by Geller. In 1998 Uri met Brian Josephson, Professor of Physics, winner of the Nobel Prize for Physics, 1973. 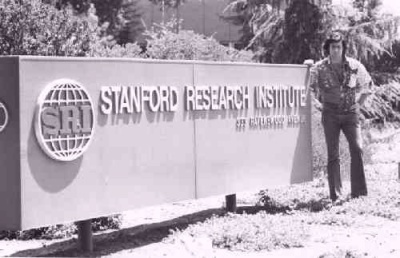 Tests at Stanford Research Institute (now SRI International) in California, where carefully witnessed Geller Effects included the creation of “loss” and “gain”; in a gram weight measured on a high-precision balance, Uri’s correctly calling of eight out of ten die-throws, against odds of a million to one; he also guessed correctly the location of some hidden targets at odds of a trillion to one! These tests are documented in the official SRI film, on Uri’s website. These important controlled experiments were published as a scientific paper in the prestigious British journal Nature. Experiments at Birkbeck College, University of London, with a team of research physicists headed by Professor JB Hasted, Professor of Experimental Physics and Head of the Physics Department, and the eminent theoretical physicist Professor David Bohm, who worked with Albert Einstein and has been honored in the naming of the Aharonov-Bohm effect in quantum mechanics after him. Here, Uri caused a Geiger counter to register 500 times its normal count deformed a molybdenum crystal 1cm in diameter and caused part of another crystal inside a pill capsule to dematerialize. Witnesses at the Birkbeck experiments included the late writer Arthur C. Clarke, the late Arthur Koestler (sponsor of Great Britain’s first University chair in Parapsychology), AV Cleaver, Director of the Rockets Division of Rolls Royce, and Professor Arthur Ellison, head of the Electrical Engineering Department of City University. See the scientific quotes and pictures on Uri’s website, which show Uri Geller with leading scientists. “The scientific community has been put on notice that there is something worthy of their attention and scrutiny in the possibilities of extra-sensory perception.” With those words the respected British journal Nature called on scientists to join – or refute – millions of non-scientists who believe human consciousness has more capabilities for real perception than the five senses. US Naval Surface Weapons Center (Silver Spring, Maryland), where Uri caused the recently invented alloy, Nitinol, to become deformed in a manner contrary to its inbuilt characteristics. Kent State University, University of Los Angeles, Lawrence Livermore Radiation Laboratory, Max Planck Institute for Plasma Physics (Munich), INSERM Telemetry Laboratories (Suresnes, France), Western Kentucky University, Department of Mathematics, Kings College, University of London, Tokai University and Tokyo Denki University and many more. Uri continued to demonstrate his abilities to scientists and highly specialised technicians in addition to the general public and TV viewers. In 1984, he erased a computer tape at Tokai University, Tokyo, in the presence of a team of scientists which included one of Japan’s leading computer experts. In the same year, he rendered a computer non-operational in Switzerland by garbling a floppy disc. In 1985, he performed a similar feat before a dozen witnesses, at the headquarters of Wang computer company near London. Uri continued these experimental demonstrations in 1986 and 1987, when he totally erased computer tapes belonging to Germany’s biggest newspaper publishing group, Axel Springer Verlag. In 1991, he again made world headlines when he stopped Britain’s most famous clock, Big Ben. He has repeated this unbelievable feat twice more; three years later when it was reported by the world’s media and again in May 1997. The clock stopped at 12:11 which is 11:11 GMT. 11:11 is Uri’s mystical number. Geller, with his friend Meir Gitlis who heads an electronics company, has developed a number of inventions that are already in production: the Moneytron (tells a fake banknote from a genuine one), the Diamontron (does the same for diamonds), the Gazgal gas leak detector, and a number of security devices including sensors for defense installations. Another invention is the Gold-Meter, a compact electronic device for examining solid and other precious metals by an electro-chemical process controlled by a micro computer. Their latest invention is a small earthquake sensor, which is affordable enough for every home. They have also developed an earthquake shock absorber, which should go into the foundations of new buildings such as skyscrapers. For users of hand held cellular telephones there is a shield, which prevents the harmful effects of long term exposure to the short waves penetrating the brain. Uri’s artistic skills began during his early childhood. A ‘pupil’ of Salvador Dali, whom he knew well, Uri has exhibited his drawings, paintings and artworks in major galleries and museums in the USA, Europe, Japan and Israel. His creations of pottery, led crystals, natural rock crystal jewellery and watches are in great demand worldwide. Uri’s drawings are featured on both Belinda Carlisle’s and Michael Jackson’s latest albums. Uri Geller also helped to design the logo of the most successful boy band in the world ever, N*SYNC. In 1992 Uri created a unique masterpiece – the “Geller effect” – by riveting bent cutlery to his 1976 Cadillac. It became an instant success and was exhibited in the prestigious Israel Museum in Jerusalem. Over a million people saw the “Geller Effect”, including Britain’s Prime Minister John Major, at the International Car Show in England, where it caused a sensation. The car has subsequently been exhibited for many charities and featured in hundreds of newspapers, magazines and TV shows across the world. From October 1999 the Cadillac was on loan to the American Visionary Art Museum in Baltimore Inner Harbor, Maryland USA and The Beaulieu National Motor Museum in England. Most of the world’s leading newspapers and magazines have carried prominent articles about Uri. These include cover stories in such publications as Bookseller; Der Spiegel; New Scientist; Paris Match; Physics Today; Popular Photography; Psychology Today; Science Digest; The Reader’s Digest; Science News; The Observer Magazine; Time, Life and many others around the world. Extensive articles on Uri have appeared in Forbes; Business Week; International Mining; Rydges; The Business Journal; Stern; Physics Today; US News and World Report; Newsweek; Time; Today’s Health (published by the American Medical Association); Omni; Discover; Jerusalem Report; New Idea Magazine; OK! Magazine; Hello Magazine; People; Focus Magazine; Sports Illustrated and many more leading papers and publications. Uri has also written regular columns in Israel’s leading daily newspaper Ma’ariv, and for Weekly News, Fate And Fortune, Yoga Magazine, Jewish Telegraph, Computer Active Magazine, Daily Mirror, The Face, GQ, The Daily Telegraph, Sunday Times Magazine, Beyond Electronics Magazine, GQ Active magazine, Quest Magazine and Beyond Magazine, Goal Magazine, Total Football, Football World, Match of the Day and Tomorrow’s World (both the latter were monthly BBC publications). Uri Geller’s Weird Web weekly column was a regular feature in The Times’ Interface. His short stories have appeared in Tatler and Interzone (a science fiction magazine funded by England’s Arts Council). T3 Magazine carried Uri’s weird science articles. Among the many prominent newspapers which have carried stories on Uri are The Times (UK); The Sunday Times (UK); The New York Times; The Washington Post; The Los Angeles Times; The Chicago Tribune; The Boston Globe; The San Francisco Chronicle; The National Observer (USA); The Atlanta Constitution; USA Today, Japan Times; France Soir; Die Welt; Tribune de Genève; Corriere della Sera; International Herald Tribune; The Wall Street Journal; The Financial Times; The Sunday Telegraph, and countless others. Uri Geller’s name has also appeared many times in the crossword puzzles around the world, including The New York Times, Washington Post, New York Magazine, TV Guide (USA), People, New Yorker Magazine, and International Herald Tribune and even in the general knowledge game of Trivial Pursuit. Marvel Comics’ Daredevil (Vol 1, No 133 May, 1976), featured Uri as “The most shocking guest star of all The incomparable Uri Geller!”. He has been name checked in many sitcoms and movies: for example, Woody Allen’s Annie Hall, Roseanne, Friends, The New Adventures of Superman and many others. Uri has had cameo roles in several feature films. Uri Geller has instilled spoon bending into world culture, movies like The Matrix with Keanu Reeves have an entire segment of spoon bending a sequence inspired by Uri. Mega bands like Incubus mention Uri in their hit song Nice To Know You. Johnny Cash, Kenny Rodgers, REM’s Michael Stipe sing about spoon bending, there are bands literarily called “Uri Geller” and “Spoonbender”, songs have been written about him and Google have millions of entries to do with Uri Geller. Movies, TV Shows, DVDs, Documentaries, Records, CDs, Games, Commercials, Radio and the Internet. Uri is also a world-renowned television and stage performer. He has appeared on television throughout the Americas, Europe, Asia, Africa, and Australia. His 1973 appearance on David Dimbleby’s Talk-In brought him overnight fame in Britain, which spread, immediately throughout the world. Among his appearances in the United States were Sixty Minutes with Mike Wallace, Lifestyles of the Rich and Famous, The Tonight Show with Johnny Carson, as well as 20/20 and a number of specials. 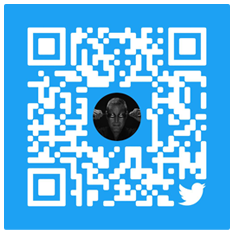 He has been a guest of Merv Griffin, Mike Douglas, Phil Donahue, Tom Snyder, Barbara Walters, Oprah Winfrey, Leeza, Larry King, CNN, and NBC Dateline. In 1995 a TV special called Beyond Belief which he co-hosted with Sir David Frost was an incredible success, watched by an estimated thirteen million people in England alone; when two point six million people called in to reply to the telepathic message Uri transmitted, the majority were right. A second and a third Beyond Belief followed (in 1996 and 1997) with the same extraordinary results. Uri also starred in his own 8 part series for England’s GMTV and in the outrageous but captivating TV reality show I’m A Celebrity Get Me Out Of Here followed by a TV profile called Fame and Fortune. BBC’s “Bending footballs” featured as the Choice of the Day in most of the newspapers and TV guides so did channel four’s On Holiday With The Gellers. A major documentary about Uri, which was released in movie theatres, won the Most Popular Film Award at the Hungarian Film Festival. scientist who discovered Uri in the early 1970s. Mindbender is the first film in motion picture history to allow the audience to “interact” with the screen action. Music is by the Bee Gees, Moody Blues, Elton John and Peter Gabriel. It was distributed among others by Disney’s Buena Vista. In 2001 on the invitation of two young British filmmakers graduates of Southampton Institute, Uri was asked to take a small part in their movie, a psychological, medical horror film called Diagnosis. The two documentaries produced for Sky in which Uri’s explores the dark side of Venice were picked up for DVD distribution and Staya Erusa, the film Uri co-produced about human consciousness, is now available on DVD in dozens of languages. Uri Geller has been featured as a guest on the Martin Short Show, the Tonight Show with Jay Leno, the Sally Jessy Raphael Show, CNN Inside Edition, the Today Show, Barbara Walter’s The View, NBC’s Exploring Psychic Powers – Live and countless more. His life and works has been the subject of successful documentaries on the Discovery Channel, the Travel Channel and Entertainment Tonight, The Biography Channel and BBC’s prestigious Reputations series produced an intriguing documentary about Uri Geller which was televised in over one hundred countries, in addition Keshet Israel’s leading TV station created a fascinating documentary titled Being Uri Geller, shown in conjunction with his hit TV series The Successor. In 1975, Uri recorded an album with famous concert pianist Byron Janis. The album was released through Polydore records and CBS records; it was recorded in seven languages. Recently the Japanese version was re-released in Japan on a CD; the English CD was made into a compilation of all the covers and is available from Voiceprint. In 1994, he collaborated with Justin Hayward of the Moody Blues and recorded a song called Nostradamus. In addition, Voiceprint released Uri’s five CD set, Explore The Hidden Gifts of the Mind, which include Mind Potential, Healing with the Power of the Mind, Words of Courage and Inspiration, Meditation, and Words of Wise People. He has done many commercials including one for PowerGen, Britain’s major electricity supplier, for Motorola cellular telephones, for Sega computer games for The Yellow Pages, Knorr, a few ice cream commercials, Nissan motors and many more. At the dawn of the website era British Telecom and Rupert Murdoch’s Springboard designed www.urigeller.com, a ground-breaking website which is interactive, informative, educational and fun which has now been re-designed by Hungary’s Webtown. Uri Geller is co-hosting a radio show with Doug Stephan every Monday in the United States broadcasting on Good Day USA from coast to coast. Uri has been invited by several leading multi-national organisations, successfully applying his special abilities to corporate endeavours combining his abilities to investigate, explore and locate oil fields, mineral deposits, precious stones and diamonds throughout the world. His success in locating a mammoth offshore oil field for Mexico’s national oil company PEMEX resulted in Uri getting a Mexican nationality as a token of appreciation and honor by Mexico’s President Jose Lopez Portillo. On an International level, Uri has successfully demonstrated his skills to the heads of the United States and Soviet Union’s delegations on nuclear and space arms talks at the US Mission in Geneva. Attending these negotiations were Vice President Al Gore; Senator Claiborne Pell, Chairman of the powerful US Senate Foreign Relations Committee; Anthony Lake, past head of the CIA; Yuli M. Vorontsov, First Deputy Foreign Minister of the Soviet Union and the chief Soviet arms negotiator; Ambassador Max M. Kampelman, head of the United States Delegation on Nuclear and Space Arms. Uri also briefed US government officials in the high-security Shielded Room in the Capitol Building, Washington, DC: his audience included Capitol Hill staff, Senators, and Pentagon and Defence Department executives. In 2004 Uri set up The Uri Geller Charitable Foundation from which he is able to helps sick and underprivileged children and various animal charities. 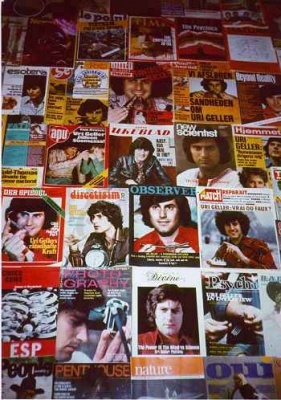 Over thirteen books have been written about Uri Geller, and more than 1,250 published since the early 1970s have mentioned him prominently, including many encyclopedias and dictionaries. Uri himself has written 15 books: the first was Shawn, a novel describing the exploits of a psychic superman caught up in the Cold War. The prestigious magazine, Publishers Weekly, reported that the book had been bought by the Russian publisher Sovaminco whose first printing was 100,000 copies. This is probably a record for a first novel by a Western author in that country. My Story, the first volume of his autobiography was published before he was thirty and has been translated into thirteen languages. The Geller Effect, published ten years later, contains a number of sensational disclosures about his life and exploits. His fourth book, Uri Geller’s Fortune Secrets, teaches people how to use their psychic abilities, positive thinking and a healthy diet to dramatically improve their well-being. Change Your Life in One Day, is a colourful big format publication, which shows readers how to improve their lives instantly. Uri Geller’s Mind-power Kit published by Richard Branson’s Virgin Publishing; it also contained an audiotape and a rock crystal, and was number one on the American Ingrams New Age Best Sellers list. The Kit was featured on QVC, the home shopping channel, selling out many times. 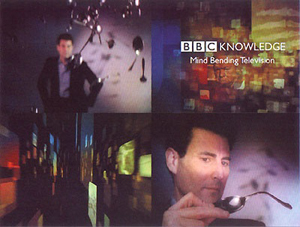 Uri Geller’s Little Book of Mindpower appeared in June 1998. The Amazing Uri Geller, Martin Ebon, New American Library. Uri Geller: Fup eller Fakta? Leo Leslie, Samlerens Piccoloboger. In Search of Superman, John Wilhelm, Pocket Books. The Geller Papers, Charles Panati, Houghton Mifflin. The Geller Phenomenon, Colin Wilson, Aldus Books. Superminds, John G. Taylor, Macmillan/Picador. The Metal Benders, John Hasted, Routledge and Kegan Paul. Uri Geller, Al Descobierto, Ramos Perera, Sedmay Ediciones. Uri Geller Magician or Mystic? Jonathan Margolis; Orion. The Secret Life of Uri Geller: CIA Masterspy? Jonathan Margolis; Watkins. His television series The Successor, which premiered in Israel in early 2007 to historic record-breaking ratings, has now been launched world-wide. Screening in the United States on NBC prime-time, under the title Phenomenon, the show was co-hosted by the mystifying artist Criss Angel. The NBC series has also been televised in Canada, Australia, Finland & Iceland. A&E, the American cable network, broadcast the NBC version of Phenomenon in Latin America, including Brazil, Argentina, Venezuela, Columbia, Mexico and many other South American countries. 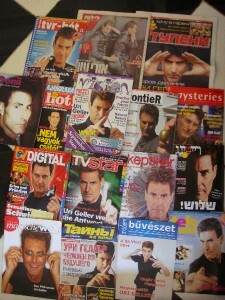 Uri Geller together with Kuperman Productions and Keshet TV created the format, and helped to adapt it for ProSieben in Germany, where it topped the ratings in January 2008. The show has also been a massive hit in Holland, Hungary, Turkey, Greece and Russia. The 3rd season 2010, has just been televised with great success.The Successor will soon be launched in Scandinavia, France, Ukraine, India China & Spain. In 2012 Uri was awarded the prestigious Golden Grolla award, at the eleventh “Masters of Magic” convention in St Vincent Italy, for inspiring the world of magic. In 2012 Uri also received the Star Foundation award at the house of commons (Houses of Parliament) in London, in recognition of his charity work. In 2015 Uri recieved The Wizard Trophy, for his contribution to the magic world.